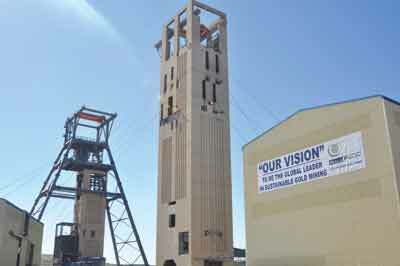 South Deep mine has a twin shaft system capable of hoisting 330,000 metric tons (mt) a month. If a reminder of the dangers of working at great depths is needed, a memorial wall outside the mine manager’s office at the developing South Deep mine bears the names of nine men who died when a cable snapped on a cage just below 95 Level in 2008. The accident was a tragic note to begin a bold experiment by Gold Fields, the owners of South Deep, to break with a long-standing practice of labor intensive mining and replace it with mechanization instead. Almost six years later and Gold Fields’ plans are close to a reality. After some delay—the project is two years behind schedule—South Deep is entering its final stage before full production begins in 2017. The immediate impressions of underground conditions at South Deep are not unlike many of the other deep level operations that pocket the earth, west of Johannesburg. It’s hellishly hot and only pumped air keeps the ambient temperature at a relatively balmy 29°C (85°F). Humidity, though, is closer to 100%, and less easily dealt with. The men toiling here are bathed in sweat and spend an entire shift soaked to the skin. Men emerging from the South Deep main shaft. Noticeably different from its neighbors, however, is just how few miners there are. Instead, amid the roar of ventilation and the thump of pumps that expel water pouring from rock threatening to drown the shaft, are machines. Lots of them. 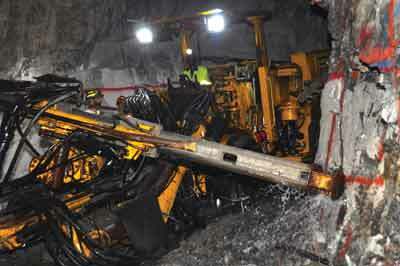 One long-hole drilling machine and eight people can produce what hundreds of workers can do in a month in conventional South African gold mines, said South Deep Senior Operations Manager Gerard Pienaar. 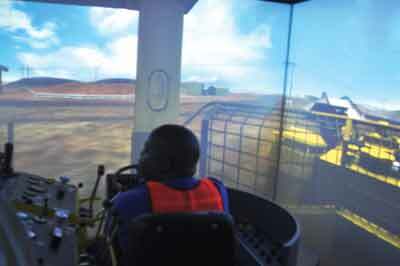 South Deep is using simulators to train drillers and drivers. It’s possible South Deep will succeed where other South African projects have so far failed—and build a viable, mechanized, high volume gold mine. 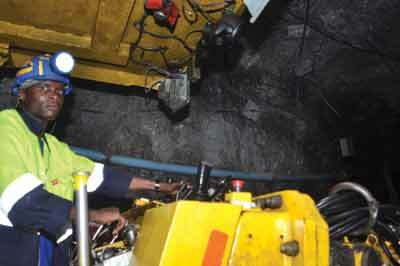 Machines are ubiquitous in other mining countries, such as Canada and especially Australia. So it’s to the Aussies Gold Fields has turned to steer its developing South Deep project into an underground assembly line using one-sixth of the usual workforce. 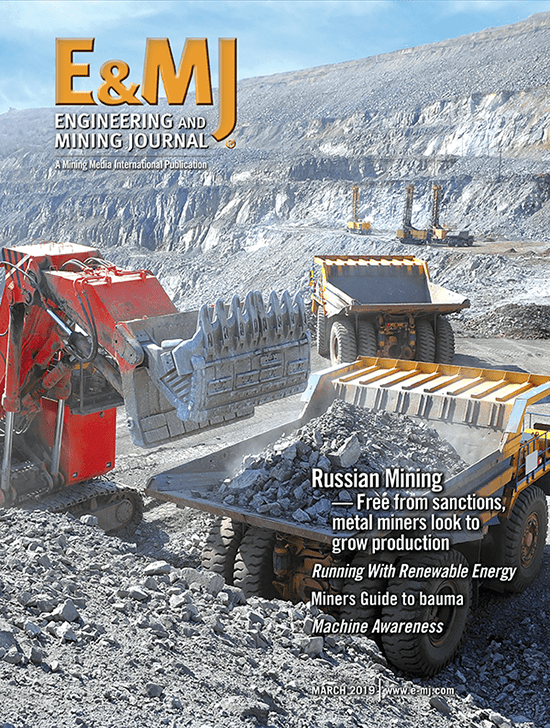 South African mining companies have long yearned for technology to reduce their reliance on a militant workforce. As operations go ever deeper, the goal is to put fewer human lives at risk by getting machines to replace them at the rock face. So far, the dream has been elusive. Uncooperative geology and lack of suitable machinery has meant that most of the country’s mines still depend on the half a million or so men it takes to keep operations going. Gold Fields, however, hopes to change that. It is advancing toward full production at South Deep, the remaining South African asset in its stable, and intends for the operation to be fully mechanized. The process has not been smooth and the mine is now two years beyond schedule. Recently the company took on a team of 15 Australians that it hopes will turn things around. Mechanization means a few men can do the work of hundreds. Previously, Mills worked on Gold Fields’ Agnew mine in Australia, a country that has operated mechanized mines for years. 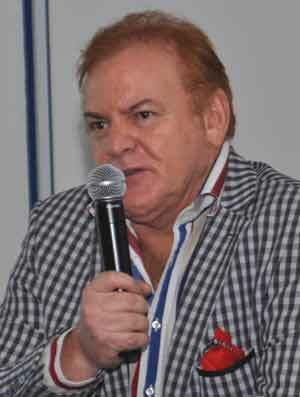 The company describes him as a man with “vast” mechanized mining experience. “When we came here we noticed they were making some of the same mistakes we did, so we need to rectify those and streamline the process,” Mills said. Gold Fields bought South Deep in 2006 from its then owners Barrick Gold and Western Areas. At that time it was being mined using conventional hand drilling, but in 2008 Gold Fields stopped all work and declared it would resume operations once mechanization had been introduced. 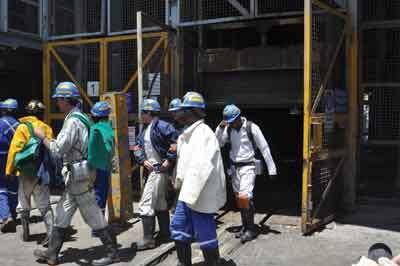 More than 2,500 workers were retrenched at the time. Halting operations was a risky move, but Gold Fields felt it was necessary if it was to advance to long-term mechanization over the course of the 50-year life-of-mine. When full production commences in 2017, the mine will be producing 700,000 oz of gold a year. Gold Fields needs a win. Its share price has dropped by more than half since it spun off its other South African assets last year to create Sibanye Gold. To add insult to injury, the parent company has watched as its now orphaned offspring has soared in the estimation of investors and delivered a healthy set of results each reporting quarter. Atlas Copco is supplying the jumbo drills. Gold Fields is also living with the shadow of a Securities and Exchange Commission hearing into a shady black empowerment deal that could lead to corruption filings against the company. So it’s not surprising that Gold Fields hopes South Deep helps to turn the company’s fortunes around. “We are moving from a project to a working mine, which requires a different mindset,” said Mills. Success of the project hinges on de-stress mining, a process that reduces the load on the rock at the great depths at which ore extraction takes place. By removing a de-stress cut, the amount of stress is reduced and massive stoping can take place either above or below the backfilled cut with a greatly reduced risk of stope wall failures. In effect, the stress is redistributed onto regional pillars. Once the de-stressing is completed and the face opened up, long-hole stoping machines will be sent in to do the work. Eventually long-hole stoping will account for 70% of tonnage mined as the de-stressing is completed. “The stress on the rock at 3 km (1.8 miles) is essentially reduced to what it would be at 1 km,” Mills explained. By 2017, South Deep will be executing 70,000 m2 of de-stressing a year. Rock drills are still used to prepare the roof of the work face for bolts. Previously all mining work was done by hand drilling. Atlas Copco is supplying Boomer 282 double-boom drill rigs for the operation, and a workshop is being built 2 km below ground to allow them to get back to work faster following repairs. 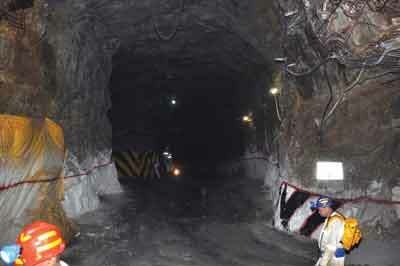 The de-stressing preparation will eventually allow the large machines to access the ore-bearing rock, which is 20 to more than 36 m thick, extending to more than 3.5 km underground, according to Pienaar. Nearly all development work is on-reef, meaning there is very little waste or dilution. 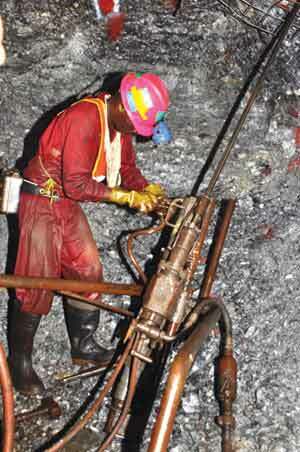 At full production, the mine will have around 280 operators. Training takes place on the surface using ThoroughTec’s Cybermine simulators, set up for the Atlas drill rigs and the Sandvik Toro 007 LHDs. It takes about a week and a half to train an operator. The simulators are also used for refresher training for staff returning from leave. Gold Fields said the simulators help lower production costs as operators no longer destroy drill bits or vehicle components while being introduced to the machine and learning its controls. They have also increased production rates, with the advance per blast and quality of the blast improved considerably. The simulated cab includes instruments and controls mounted on a motion platform to provide accurate motion perception, and an impressive diesel roar as the operator “drives” the machine. The cab area is surrounded by a wide-angle, high-resolution projection display system coupled to surround sound audio. Control of all training aspects is exercised in real time from an instructor station. 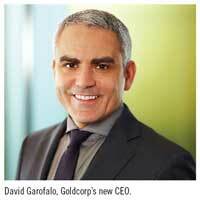 In a departure from the convention of using migrant labor, Gold Fields is concentrating on hiring locals. The company offers a six-month course that it believes will create a pipeline of steady new recruits. Gold Fields’ CEO, Nick Holland, is confident the mine will be in full production by 2017. 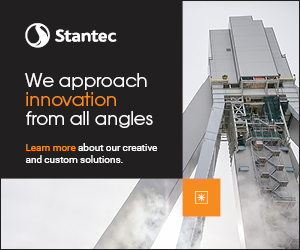 The project consists of a main shaft and a ventilation shaft—collectively referred to as the Twin Shaft complex, which has a combined hoisting capacity of 330,000 mt per month (mt/m) of ore. Four winders hoisting 32-mt-capacity skips provide the lifting power. The ventilation shaft has been deepened from 2,743 m to match the depth of the main shaft. It is now fully equipped, with ore-storage silos and conveyor belts at shaft bottom, a new rock winder and headgear. The vent shaft headgear is one of the largest fabricated steel headframes in the world, according to Gold Fields; more than 2,000 mt of steel went into its manufacture. The South Deep metallurgical plant, which was commissioned in November 2012, has also been expanded and has increased processing capacity from 220,000 mt/m to 330,000 mt/m. Gold is recovered using four Knelson concentrators, and gold adsorption is conducted by an eight-staged carousel-type carbon-in-pulp circuit. De-stressing allows for wider access ways that make using machines possible. The centralized tailings storage facility, installed infrastructure around the shaft systems, and full plant tailings backfill for increased production levels are also completed. Currently total reserves at South Deep are estimated at 39.1 million oz and Holland said although costs are now running north of $1,300/oz, at full production an all-in cost of $1,000/oz is expected.